Obando, Bulacan - with 9 Barangay still submerged in floodwater, the local government have suspended classes on all levels. Valenzuela City - Pio Valenzuela, PR San Diego, San Diego Parochial Sch, Nuestra Senora de Guia Acad Elementary School, Rincon Elementary School , Pasolo, Isla, Tagalag, Coloong, A. Deato , Wawang Pulo. Rain to Continue Until Tomorrow Although Typhoon Gener is already in the northern part of Luzon, it is expected to intensify moonsoon winds bringing rains in Metro Manila and Visayas region. So, for tomorrow, be ready with your rain gears. Capturing the first victory for the Philippine Olympic Team, our sole boxing contender, Mark Anthony Barriga beats Italian opponent Manuel Cappai in the Round of 32, advancing him to the next round, Round of 16 of the Olympic Boxing event. Barriga is fighting in the Lightweight Division. The next round for the Filipino boxer will be on Saturday, August 5 where Barriga will face Kazakhstan’s Birzhan Zhakypov. Barriga's win is not surprising considering the immense popularity of boxing among Filipinos. Manny Pacquiao, a Filipino professional boxer was crowned as one of the greatest pound-for-pound boxer in history. Also, the boxing event have captured most of Philippines' Olympic medals. Five out of nine medals won by the country was obtained through boxing. The last one was a silver medal by Mansueto "Onyok" Velasco in 1996 Atlanta Olympics. Interestingly, the last four Olympic medals of the country was won through boxing. - Malabon: Panghulo HS, Dampalit ES main and Dampalit ES 1. The Olympic torch -Beijing 2008 Olympics (Photo credit: Wikipedia) The most prestigious sports event in the world, the Summer Olympics has already begun. This year, it is London who hosts the event. With over 10,000 athletes from more than 200 countries participating in more than 300 different games, the Summer Olympics is indeed the grandest event in the sporting world. An Olympic gold medal or even just an Olympic medal is the ultimate dream of most athletes. In the Archery event, the Philippines have two players for both Men and Women's division. They are Mark Javier and Rachelle Anne Cabral respectively. Lois Lane and Superman in Superman Returns (2006). (Photo credit: Wikipedia) Have you had fun watching The Dark Knight Rises? Well, next summer, Dark Knight Director Christopher Nolan will bring to you another movie version of a popular DC Comics character: Superman in the movie entitled Man of Steel. Skyline of the City of Manila, seen from the Cultural Center of the Philippines (Photo credit: Wikipedia) Are we Filipinos polite? Well, politeness is a blurry quality that is not easily measured because it can be affected by an individual's viewpoint and his cultural background which includes the customs and norms in his community. For instance, a polite gesture in one culture may be the exact opposite on the other. (1) For 20 times, the researcher follows a person in a door of a public building and see if the one ahead will hold the door for him. (2) The researcher buys small items from 20 different stores in the city and see how many will say "thank you". Natural Coco Water (Photo credit: im elsewhere) "Coco Water" trends in social network Twitter minutes after President Benigno "Noynoy" Aquino III mentioned the term in his third State of the nation Address (SONA 2012). The term actually refers to the the edible liquid found inside the coconut commonly referred to locally as "Buko Juice". Netizens reacted to the figures that President Aquino reported about coco water exports. According to his SONA, coco water exports rose from 483,862 liters in 2009 to 1,807,583 liters in 2010 and to an astonishing 16,756,498 liters in 2011! After he mentioned the last figure, it was reported that the session hall where the SONA is held broke into applause. English: Philippine President Benigno S. Aquino III (2010-present) (Photo credit: Wikipedia) Today, President Benigno Aquino III will deliver his third State of the Nation Address (SONA) before the 15th Congress. He is expected to report progress updates in key aspects of the Philippines such as economy, education, peace and security and other things that concerns Filipino people. This event is usually televised via major networks in the country such as ABS-CBN and GMA 7. But with the advances in internet technology and the rise of Social Networks, the government has decided to live stream the event via internet. The purpose is for the President's message reach the increasing number of Filipinos who prefers internet over TV. The Dark Knight Rises (Photo credit: Wikipedia) Have you watched the latest Batman movie? The last installment of Christopher Nolan's trilogy? Well, I'm not gonna spoil your excitement by telling the movie plot but I just want to say that if you're planning to watch the movie, well, do it fast and if you'll have the chance to watch it in an IMAX theater, it's not a waste of money. The movie lived up to what it promised: an epic conclusion to the Batman series starring Christian Bale as Batman himself. Before I watched the movie yesterday, I made sure that I prepared myself. Since this is the conclusion of the Batman trilogy, I decided to review the plot of the first two movies: Batman Begins and The Dark Knight. Thanks to Wikipedia for the free information. Due to the heavy rains brought by a low pressure area in Luzon, the Department of Education (DepEd) have announced suspension of classes in some Metro Manila cities. At this point, Pasay, Pateros, Manila and Parañaque, Marikina, Malabon Cities have declared class suspension from elementary to High School. Please take note that the suspensions applies to both Public and Private schools. Also, the suspension was made by the respective LGUs. The Dark Knight Rises (Photo credit: Wikipedia) The epic third and final installment of Christopher Nolan's Batman movie series entitled "The Dark Knight Rises" is now showing in theaters here in the Philippines. Is Monday, July 23, 2012 (PNoy's Third SONA) a Holiday? Pres. Noynoy Aquino (Photo credit: Wikipedia) Well, I guess many of us is asking whether Malacanang will declare Monday, July 23, 2012 as a national holiday because of President Benigno "Noynoy" Aquino III's third State of the Nation Address (SONA). Well, the answer is "probably not". Based on previous two SONA's (2010 nad 2011), Malacanang decided to make the SONA day, a regular working day to everyone. There is a reason to believe that it would be the same this year. Also, as many of us must have already noticed, Aquino's administration is discrete with holidays. That is why, only in certain cases that he declares new holdays aside from those whom he already pre-programmed before the year begins. For 2012, Proclamation No. 295 list down specific holidays to be celebrated this year and SONA day is not included, although the President have the power to change it. Two Faced (Photo credit: Son of Groucho) I became curious about him because I saw his name trending in searches for the past week. Well, if you don't know him, here's some of the information about him that may make your hairs stand. Edward Mordrake (also know as Edward Mordake) was reportedly an heir to an English nobility in the 19th century who have two faces. The other face cannot speak or eat but can laugh and cry. (Eerie!) He begged his doctors to remove the extra face because according to him, it whispered Satanic words at night. According to reports, no doctor would attempt to remove it. He committed suicide at the age of 23. Does Edward Mordrake's Really Exists? We'll, Edward Mordrake's existence is still debated until this day. There was no record of his birth or details about his condition. Although there have been few people who have a similar (having two faces) like him. (Photo credit: Wikipedia) Mark your calendars on August 8, 2012 because SM Cinema will start showing the film Bourne Legacy starring Jeremy Renner, Rachel Weisz and Edward Norton. The movie is expected to showcase action pack plot and amazing stunts. And the most exciting thing about this movie is the fact that many scenes in this movie were shot in Metro Manila and other parts of the country. On August, we will see Manila as represented by a Hollywood movie. Häagen-Dazs logo (Photo credit: Wikipedia) After announcing that they will be the leaving the country, Haagen-Dazs Philippines announced today a sale on selected ice cream products. The sale slashed down prices to as much as 50%. The Luxury Ice Cream brand made the announcement through their Facebook Page. Two days after the news of Dolphy's death broke out, President Benigno "Noynoy" Aquino III declares Friday, July 13, 2012 as a national day of remembrance in honor of the late comedy king. In statement, deputy presidential spokesperson Abigail Valte says that "The President issued the proclamation in recognition of how the nation deeply feels the passing of Dolphy. In the proclamation, the President cited Dolphy as a man who will live on in Philippine cultural history—and in the hearts of many of his countrymen." Shed also added that the proclamation aims to encourage the Filipinos to reflect on Dolphy's contributions to art and artistry, his personal kindness and generosity, and deep patriotism. Philippine Entertainment industry King of Comedy Dolphy is dead at 83! This is after months of being confined to the hospital. And his death sends shockwave of internet buzz primarily through social networks like Twitter and Facebook. 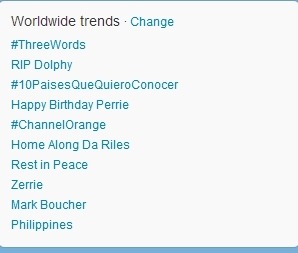 As of the time of writing this article, the topic "RIP Dolphy" is trending on Twitter Worldwide (see screenshot below). Dolphy (Rodolfo Vera Quizon, Sr.) has been one of the prolific actors in the Philippine cinema starring in hundreds of films and gaining numerous awards from several award-giving bodies. To some people, his death might be surprising due to early reports that his condition continues to improve. For instance, in an article publish at abs-cbnnews.com last Sunday, July 8, 2012, the doctors claimed that the veteran actor responds favorably in his pneumonia treatments. The rainy season is here! And as part of the tradition of major network stations in the country to compose a so called "station ID" for every major season (Summer, Christmas and Rainy Season), the largest Media Network in the country, ABS-CBN releases their newest station ID for this years rainy season entitled "Ulan" (Filipino word for "rain"). The Ulan Station ID features famous faces like John Lloyd Cruz, Bea Alonzo, KC Conception, Coco Martin and many new and young faces in today's TV. The song was sung by ABS-CBN actress and host, Toni Gonzaga. Please see below the embedded the YouTube version of the Ulan Station ID. Speaking of TV Network, it was reported earlier that the deal between Manny Pangilinan's group and the controlling families of GMA7 was already finalized. The report mentions that the value of the deal is worth 52.5 Billion Pesos. Skyline of the City of Manila, seen from the Cultural Center of the Philippines (Photo credit: Wikipedia) Manila Mayor Alfredo Lim has formally suspended the afternoon classes all over Manila due to heavy rain and floods. This suspension covers pre-school, elementary and secondary (high school) level. It is not sertain whether the announcement covers college classes. Classes in other Metro Manila cities was also suspended by their Mayors. For instance, all classes, except college, in Paranaque City has already been suspended earlier. Navotas suspends classes up to High School. Classes are now suspended in PUP-Sta. Mesa, PUP-San Juan, PUP-Commonwealth and PUP-Taguig.